Owning your own business can be overwhelming. If you’re not managing administration or social media, it’s bookkeeping or content creation causing you stress. Deadlines are self-imposed but no less difficult to manage. And the thought of growing your business? Who has time for the thought, let alone the practice! You are most certainly not alone if you feel this way. BUT, it doesn’t have to be like this! Ever heard of the term VA? A VA, or Virtual Assistant, could be the answer to the stress that comes with doing everything for yourself, all of the time. As a business owner, outsourcing some of the more time-consuming tasks to an experienced VA can help you find the time you need to concentrate on growing your business. So, what is a VA? Virtual Assistants are self-employed contractors who provide professional admin, technical, or creative assistance to clients remotely. No matter what job title they take on (and there are many!) VA’s help with whatever you might need, from one-off projects to ongoing weekly or monthly support. A VA provides their time and energy so that a business owner can concentrate on other more complicated tasks, get moving on growing their business, or enjoy a much-deserved break! Hiring a VA is not the same as hiring a full-time employee. You don’t have to worry about the paperwork that goes along with a new employee, and as independent contractors, VA’s are responsible for their own taxes and bookkeeping. You also don’t have to invest in setting up an office space. VAs supply their own computers, telephone lines, internet connection, workspace, etc. While you may have to supply any company specific software, almost everything else is built in to the VA’s contracted rate. Additionally, you’re not paying for annual or sick leave. Taking on a VA is taking on a specialist. VA’s specialize in various tasks, but ultimately the key is that those tasks are no longer on your to-do list. You only pay VAs for the work they do, and the time it takes them. Employees have to be paid whether they have been productive or not, so if you have a quiet week ahead, you’re paying them to sit there doing very little. And VA’s come with lots of relevant and transferable skills and experience, which means you provide minimal initial training, and can put them to work right away! 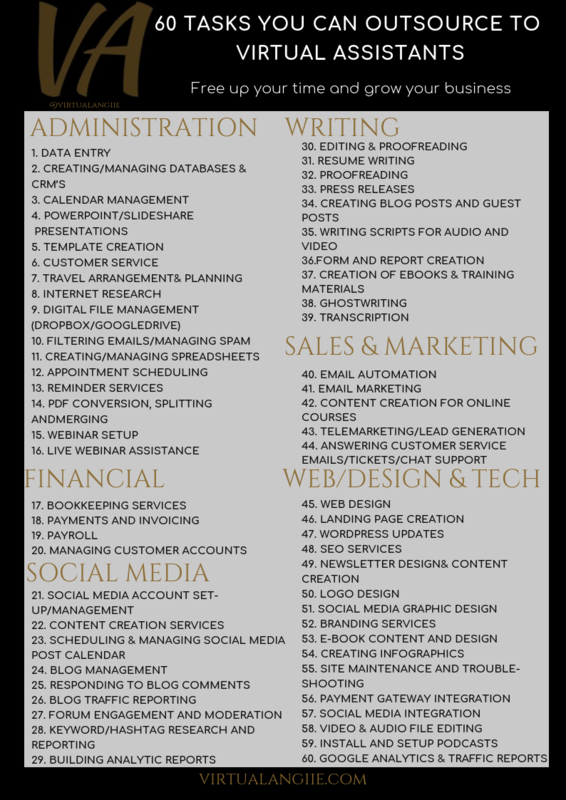 Here’s a list of tasks you should consider outsourcing to a VA! 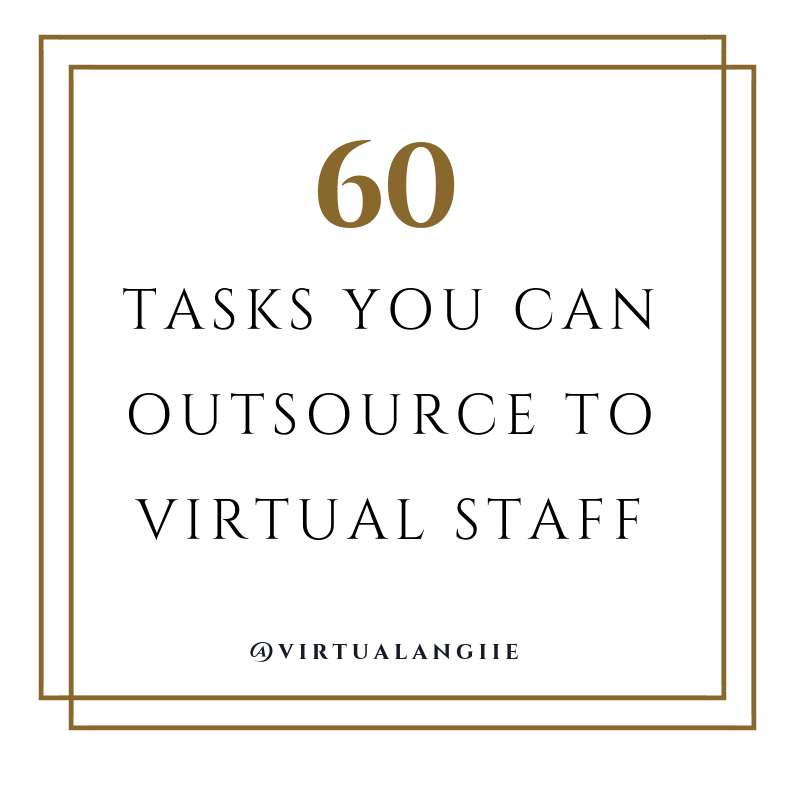 There you have it, just 60 of the many tasks you can delegate to a Virtual Assistant today. So, what are you waiting for? Find yourself a VA and start outsourcing now!